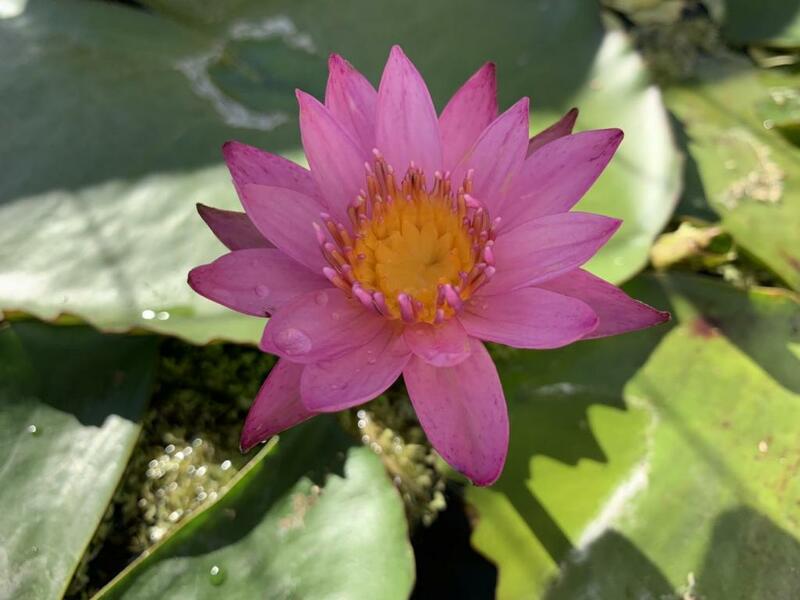 I have been having a lot of enjoyment growing tropical water lily in containers. Here are some photos from last year in the garden. This one is very good at creating plantlets on leaves. 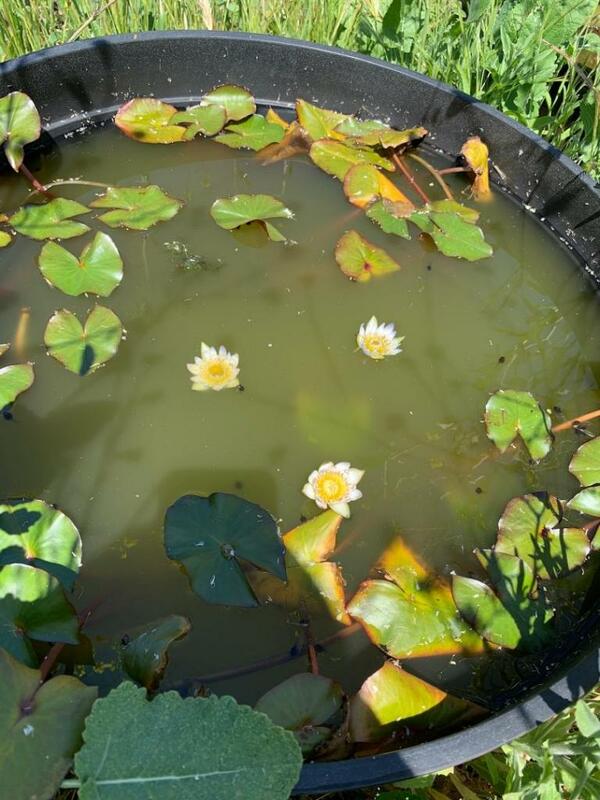 I like using horse water trough’s for growing water lilies. This one was a new addition last year to the garden. Even the leaves of some plants can be very colorful. Great pictures, You growing these in CA. or Hawaii? This is my newest addition to the garden I am thinking about using this Horse trough for producing new plants from leaves cuttings later on in the year. But for now it is housing two new plants I Purchased on Amazon from Florida colors. 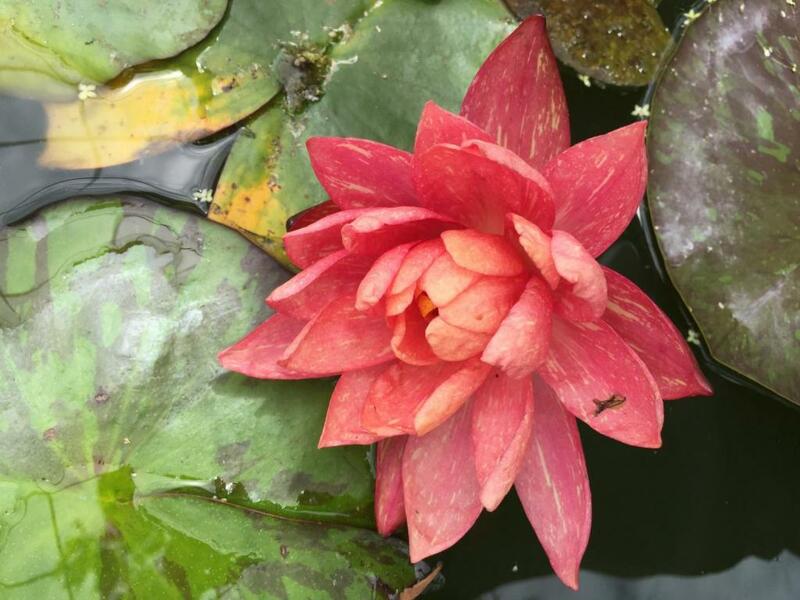 And yes I did say I purchased on Amazon I Purchased most of my water lilies on their site. I even ordered some from Thailand two years ago. 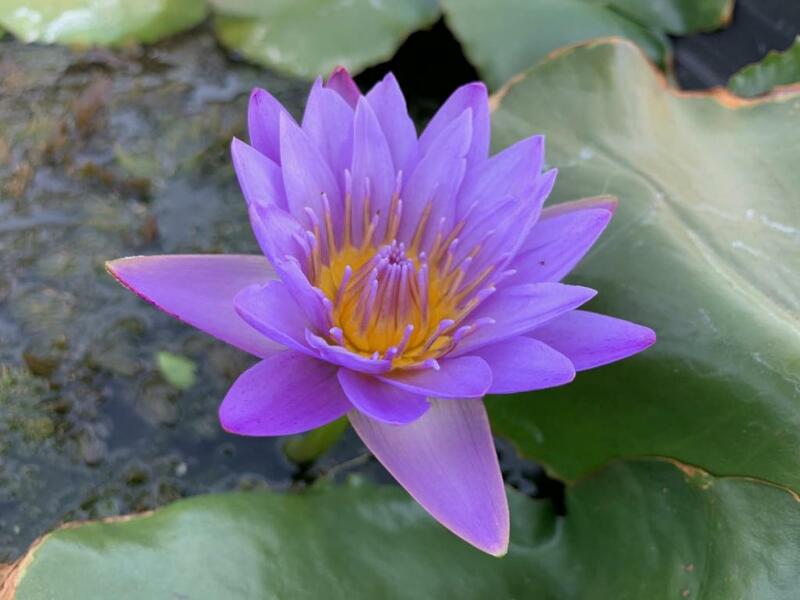 Here is a photo of Water lily ordered on Amazon from Thailand. These guys are growing in California. The ones I had growing in a Hawaii got damaged from the wild pigs. I have been using a horse water troughs for years now since I was a kid. 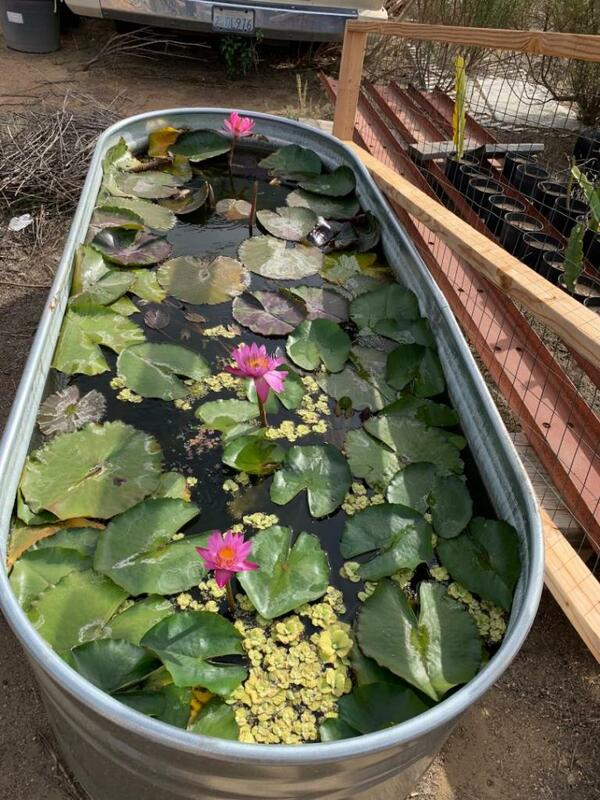 The big tubs you get from Home Depot or Walmart are very affordable water garden containers. I really love the Big pots Costco had for the past few years the new were version is skinnier. 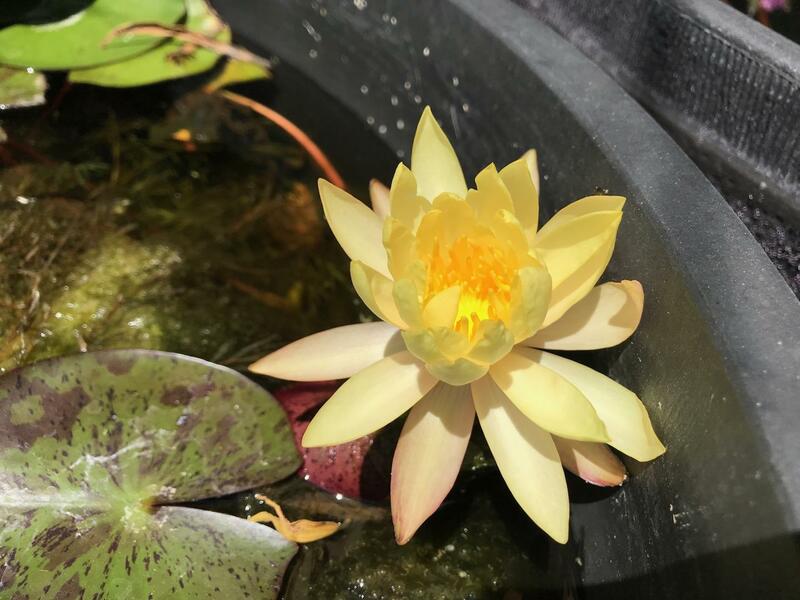 You don’t have to have a big garden to have a tropical water lily in it. 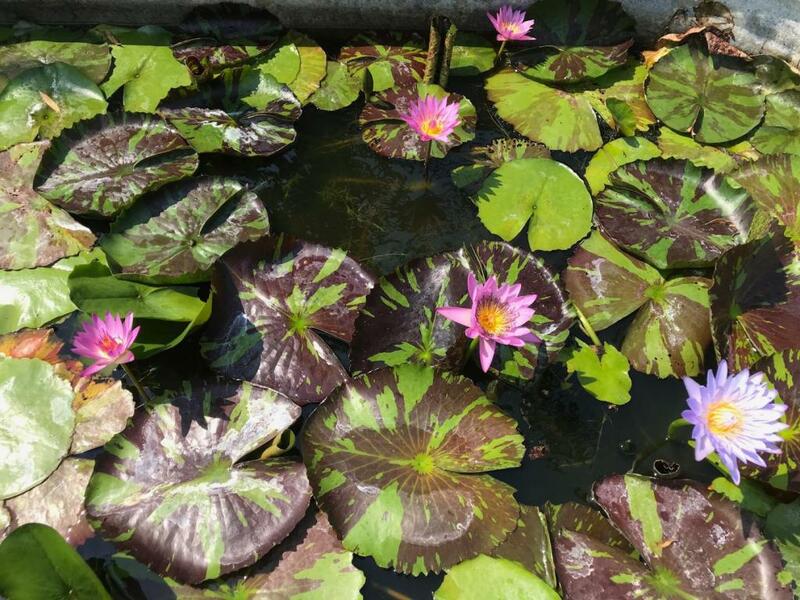 You can never have too many waterlilies! Kevin do you add any fish to your containers? 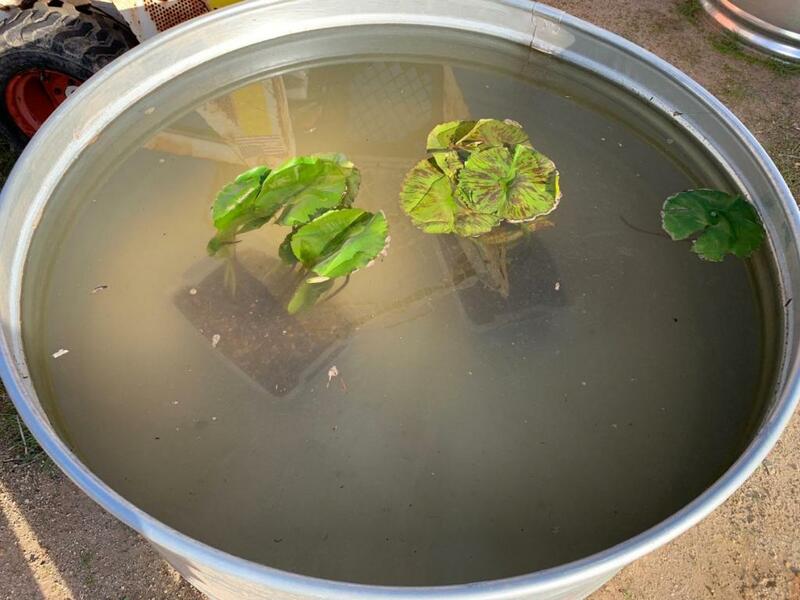 A few guppies added can turn a water garden into a mosquito exterminating machine. These are the guppies I have been using for the past few years I overwinter a few in a fish tank every year. There were only a few flowers this weekend but the water is warming up soon I will have a lot more. Right now I really need to do a lot of cleaning out but I got so many tadpoles I don’t want to hurt makes it a little hard. What a great setup! 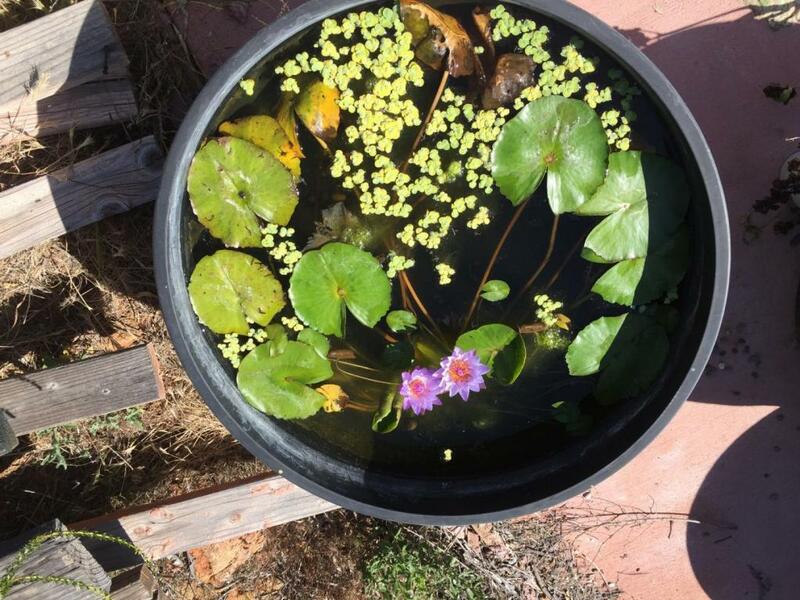 I've thought about trying water lilies in a large container but we have a huge mosquito problem in FL and my husband is a mosquito magnet since he got lymphoma. I'd certainly have to keep lilies in full shade as our ferocious sun will parboil them and any guppies I might add. Throw some mosquito fish in and you won't have too many problems with mosquitos. You probably would need to keep them in full sun. 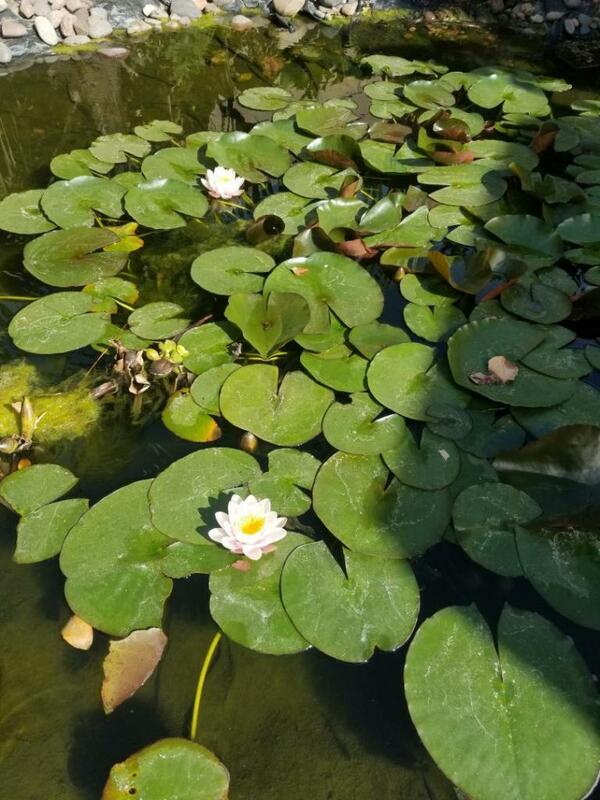 My experience was in Central Florida the tropical water lilys flowered and grew best when exposed to bright sun, warm water, and were fertilized regularly. When I stopped fertilizing mine all died out. The hardy ones don't seem to need as much fertilize. 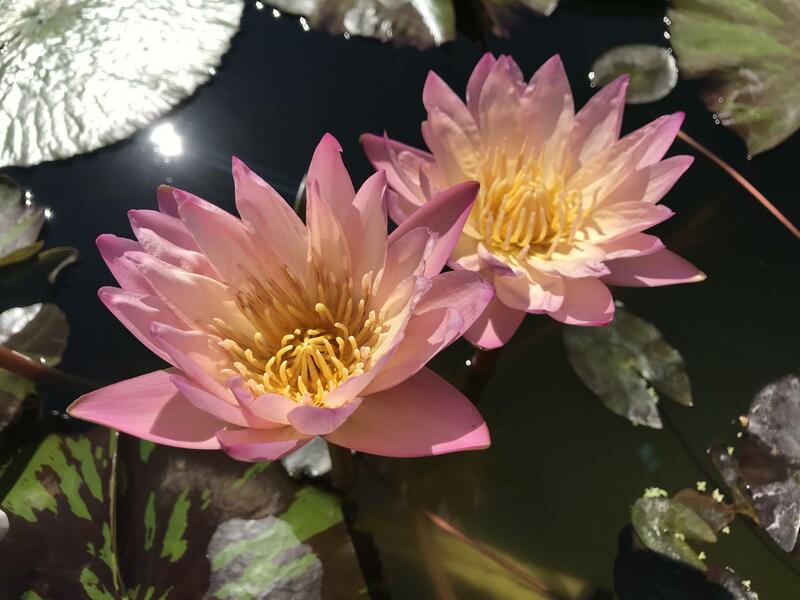 I only have hardy lilies in my pond but they look great. Honestly I find it hard to see the difference between hardy and tropical. Mine just started blooming today. 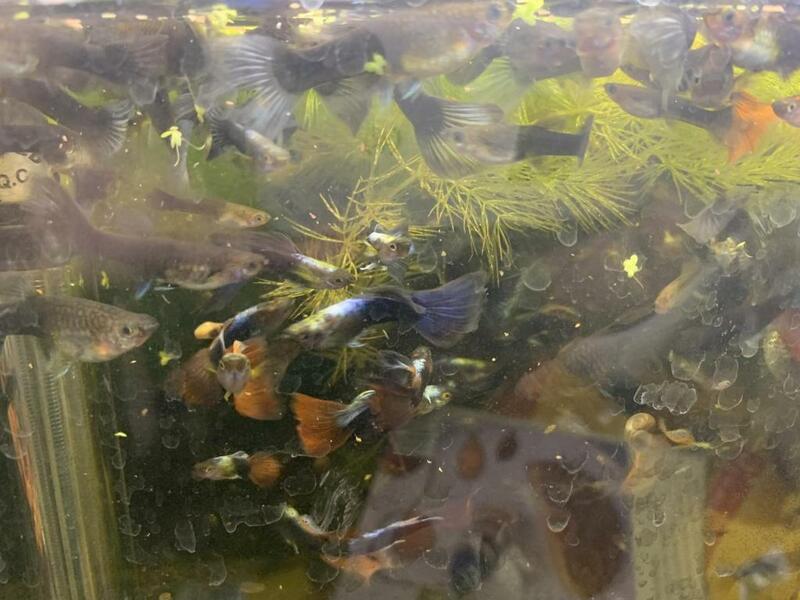 Adding mosquito fish is always a good idea along with a small pump for circulation. I added a picture to show my hardy but don't think tropical would do so well here. I like the horse trough idea! 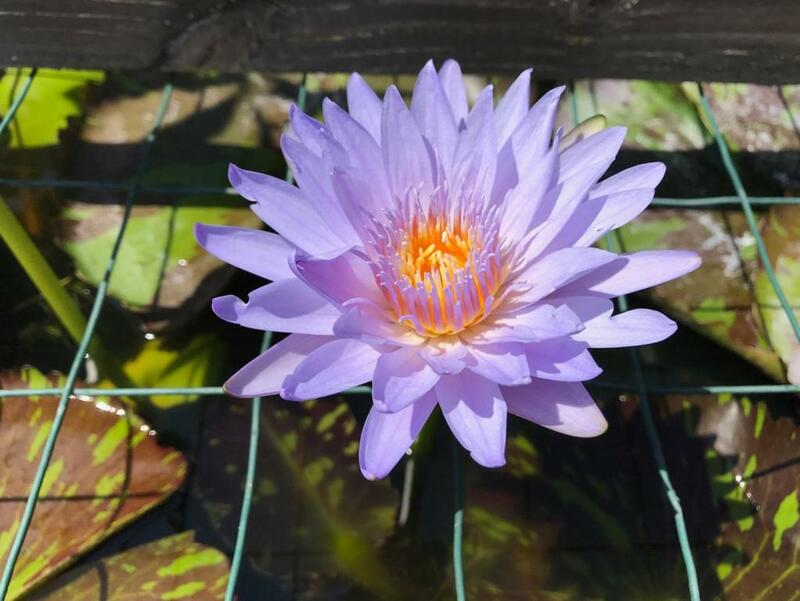 This is a photo of one of my favorite hardy water lily I have. 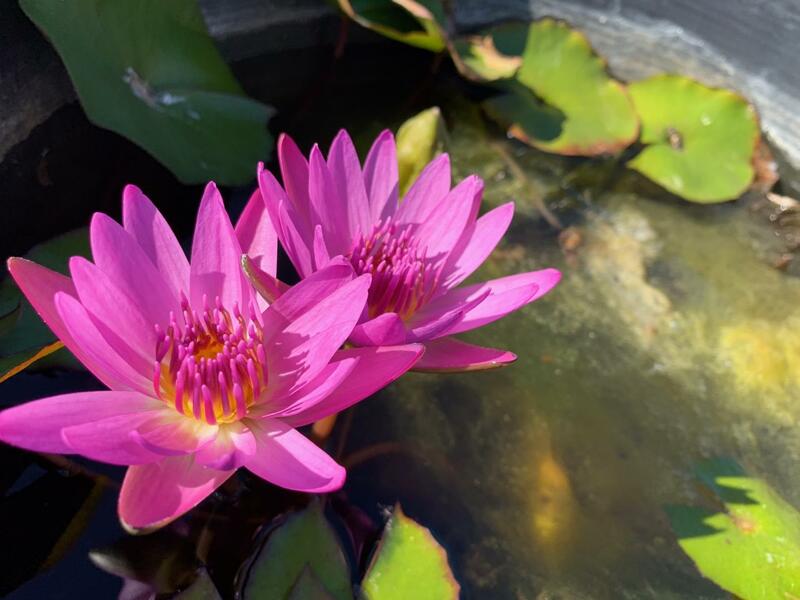 The big difference between tropical vs hardy types -as i understand it- is tropical types extend the color palate to blue, purple and bright reddish- pink / almost scarlet, flower longer through the season / flowers stand taller out of the water, and offer both day and night flowering sp. Several of the Tropical types are supposedly root hardy outdoors down to zone 9a / 8b, at least from what i read on different seller's sites. 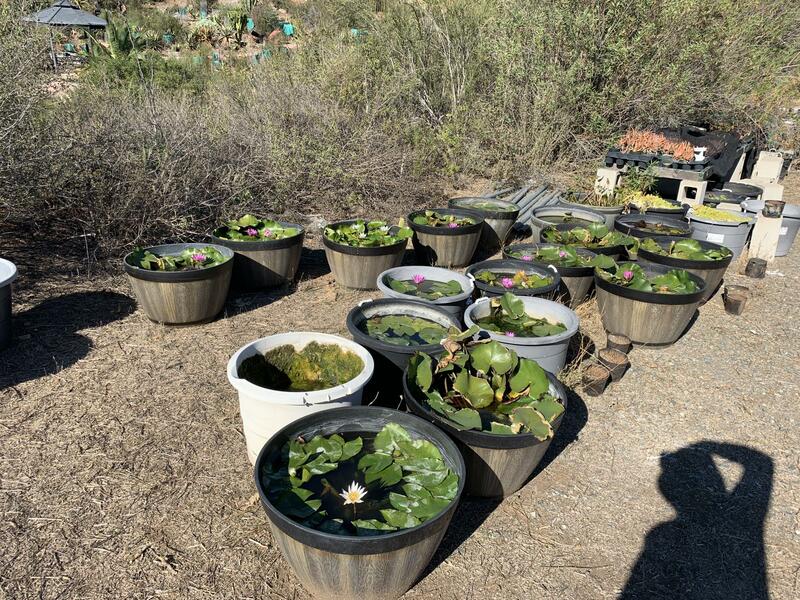 One of those sellers, Turtle Island Waterlilies, successfully crossed tropical and hardy sp. and introduced blue / purple colored flowers into the hardier types. A majority of the crosses the owner has done are stunning.. esp "X Almost Black". "X Tanzanite" and a uncommon, Blue - flowered sp. from Australia are 1st and 2nd on my personal list, along with the bright red-pink, night flowering types which are also extremely fragrant. Honestly I didn't do much research just wanted to make sure they do good for me. I just figured visually they look close. Hardy species go dormant for a few months but grow back super fast. I never saw mine flower this early which means I'll see them flower until November. I know what I have is some sort of hybrid. I did read about the night bloomers being very fragrant and if I had a bigger pond I would try it down the road. I like the idea of seeing blue flowers! One day I will redo my pond. The raccoons messed up the rocks but i still thinking it looks cool regardless. When I do redo it I plan to add more plants but I do like what it adds to the tropical looking garden. I hear ya.. nothing wrong w/ playing it safe. Didn't really start researching Tropical sp. until someone ordered a couple blue flowering types to sell at a nursery i worked for back in San Jose several years ago. 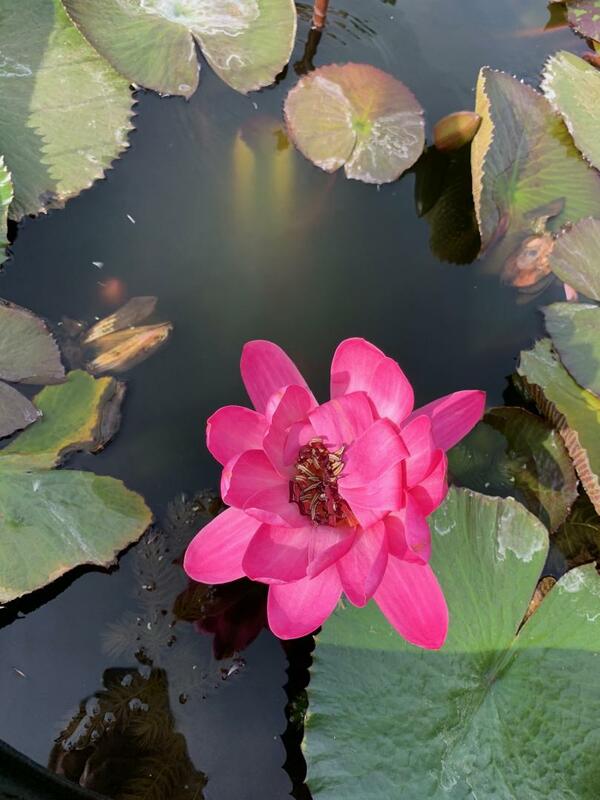 Agree that a pond w/ lilies adds to the ambiance of a lusher landscape. Racoons aside, your pond looks great. Like you said, you can always improve upon anything you might not like right now later when you have more time.. I like the Horse trough idea because, say you have a covered patio, you can place them under it around the perimeter / under windows of the patio where you can enjoy the flowers more ( and keep the bigger critters out, lol ) plus, i have an idea using porous chunks of Lava rock or Aragocrete ( DIY live rock for reef systems ) attached to a frame built behind each trough where i can attach Orchids, etc, and set up drip or misters over head that pull from the the troughs. Any runoff goes back into the troughs so very little water gets wasted ..or is my thought. I'm sure you could buy some type of similar set up but i'm sure it would cost more than building myself. Just an idea, for now. Night blooming tropical water lilies are the most cold sensitive. 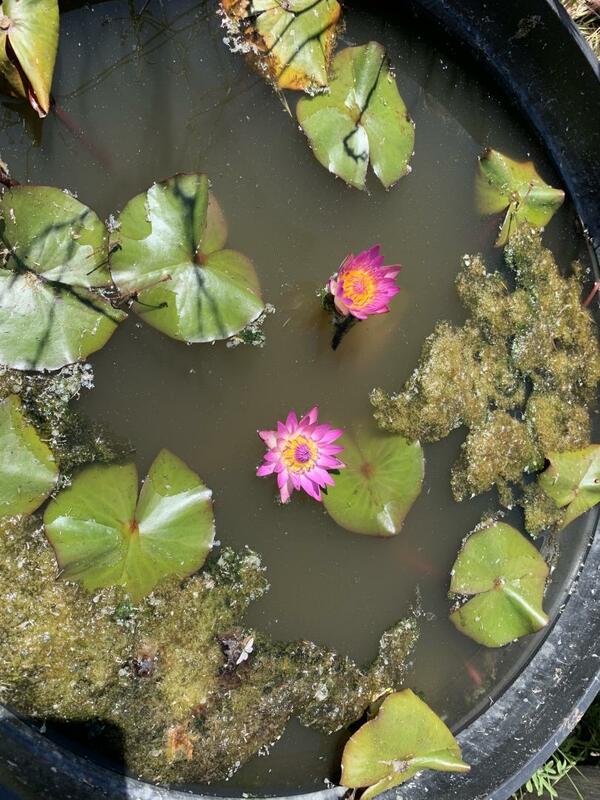 I have some night blooming water lilies but right now they’re completely dormant. For me I’m lucky enough I could grow tropical water lilies with year-round flowers. 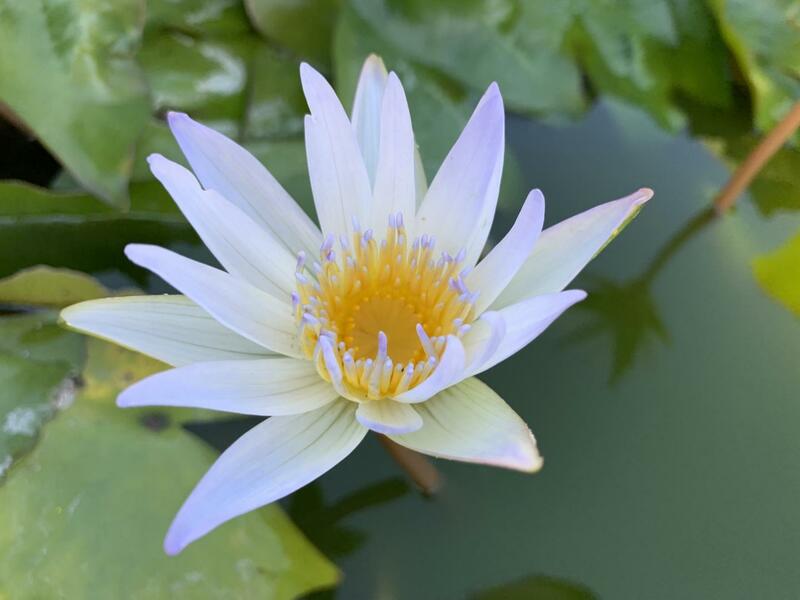 Tropical water lilies have very fragrant flowers. This poor beat up flower was of a night bloomer. A bit of a surprise find while out grabbing some fertilizer, ...and a new cactus, lol. Plus a couple bonus shots. Lilies. Hardy type i believe but what a display. 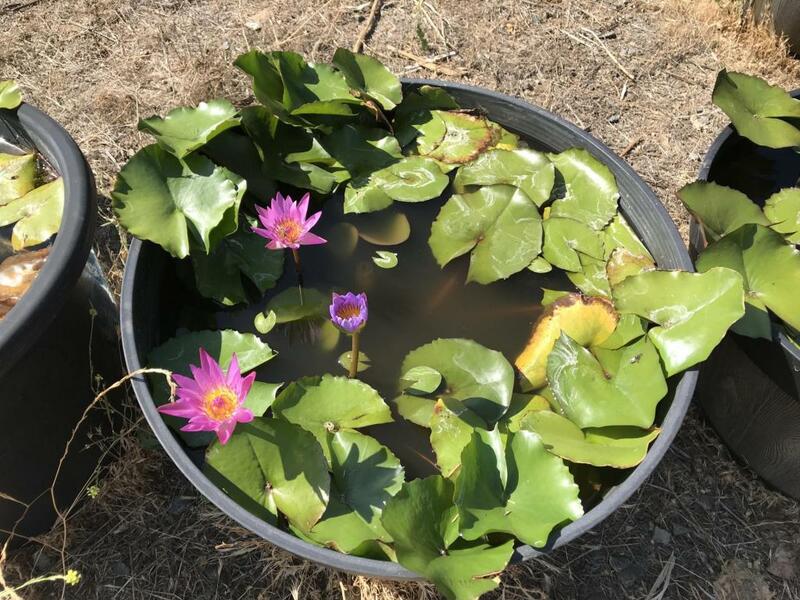 Knew they had them in their pond here but never really stopped to take a closer look, until lured in by all the flowers today..
Lilies, and a famous Mule. "Torch Glow" Boug. specimen in the background, up in the hill below Brahea sp.. Ignore the ugly Queen on the right of more attractive Mule. Perhaps the area's most well known Royal. Glowing hot pink, somewhat hidden "tree" is a well -trained Bougainvillea. Watch out for the "critter" hiding below the Twisted Myrtle to the left, lol.